Lately, the San Diego news media has been covering all aspects of the all-important seal issue of the Children’s Cove in La Jolla, from the seal lovers who want humans to stay away to La Jolla locals who want to take back the beach. One group whose comments have, sadly, been missing form the debate are from the seals themselves. That is, until now. Fahrenheit recently asked nationally renowned animal communicator Brigitte Noel to talk with the seals and get their take on the whole Children’s Cove issue. Noel, a Mission Hills-based animal communicator, says she knew little about the current seal-human skirmish before taking on the assignment but has telepathically communicated with wild animals before. Noel has been talking with animals for ages and has even written a book on the topic, LoveLink: Heart To Heart Communication With Animals. She does it by meditating on the creatures and writing what comes to her brain during the experience. She says what she wrote down is straight from the seals’ mouth-if they could speak. Noel spent 40 minutes mentally commiserating with the La Jolla seals and says they tend to speak with a group voice. Noel believes she was able to get the basic concept of their message to humans in four words: Go some place else. 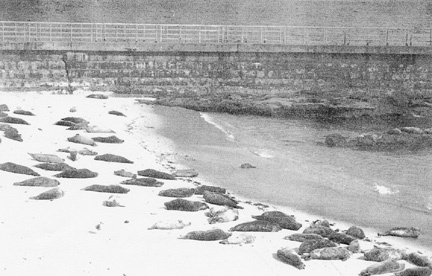 According to Noel, the seals have planted themselves at Children’s Cove for peaceful reasons. Thanks to Noel’s animal attraction with the seals, we were able to pin down the seals of the top issues facing their life in the Cove. Noel elaborates by explaining that every time people come to the Cove, “they get seal energy. They get to share in a very special, special manner.” As a result, she says, they are a bridge that allows humans to connect with their own feminine side. Noel figures the seals feel they have no other options but his beach and they are fed up with the human egos. A fact proven by their response to the last question: Why did the humans get attacked when they swam up on the beach? Noel says the seals find the city’s reaction to their presence confusing. On one hand, people seem to like them, but on the other, they get cranky over the amount of seal poop. 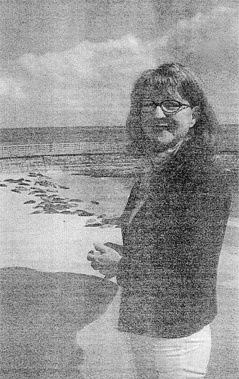 She says the seals want folks to realize you can’t have the benefits of their presence without the inconveniences and point out that the seagulls don’t seem to mind. 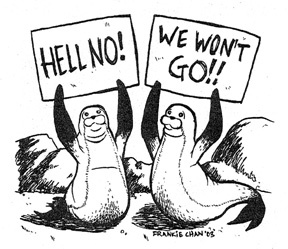 So far, the seals have yet to hire a big city attorneys like Chargers lawyer Mark Fabiani to speak on their behalf but Noel says they figure that humans should be able to build another breakwater elsewhere and create another Children’s Cove somewhere else. Meanwhile, don’t expect things to change. These seals seem to be in it for the long haul and are willing to do their sit-in for as long as it takes.